There is an extensive literature on river classification resulting in a large number of classification schemes developed for purposes ranging from understanding landscape evolution to engineering design for river restoration (Kondolf et al. 2003). Some have already been discussed. Stream order (Table 1.1) is a useful measure of stream size and position, and is easy to derive. The three longitudinal zones of Schumm (1977) -erosional, transfer, and depositional - identify regions of supply limitation versus transport limitation of sediment movement. Channels can be divided into bedrock, colluvial, and alluvial beds, and the latter further subdivided (at least for mountain drainages) into types determined by transitions in process domains and forcing by LW (Table 3.3). Additional descriptive classifications include whether a channel is straight, meandering, or braided (Leopold 1994). Flood-plain rivers have been characterized based on river planforms (Kellerhals and Church 1989). A classification scheme devised by Rosgen (1994, 1996) and widely used in river restoration recognizes seven major and 42 minor channel types based on channel pattern, width to depth ratio, sinuosity, and bed material size. Why so many classifications, what is their value, and are some better than others? That discussion is likely to continue for some time, and readers should consult Kondolf et al. (2003) for the best current summary. One purpose is to enhance understanding, by providing insights into the processes that are responsible for the great variety of river types. This in turn provides an important framework for further investigations, allowing one to categorize the river types of a region, sample appropriately, and compare like to like. A second purpose is for management and restoration. Reference sites are necessary to set expectations for channel conditions and biological composition, and inventories of the status of streams can be accomplished with greater statistical reliability when the sample universe is appropriately defined. Categories are also useful for communication among specialists working in different fields and regions. Balanced against these obvious advantages are some limitations, chiefly that classifications are artificial human constructs (Kondolf et al. 2003). Classifications aid our understanding so long as we are suitably cautious in applying them. And whereas scientific understanding is aided by a general model regardless of its ability to exactly define thresholds between categories, managers often need to categorize a particular reach, which may not fall neatly into one category. Especially when classification is used to establish expectations for restoration of a stream reach at considerable expense, it is debatable whether classification is a useful tool or a hindrance. Kondolf et al. (2001) described the failure of a restoration project on a 0.9 km reach of Uvas Creek, near Gilroy, California. 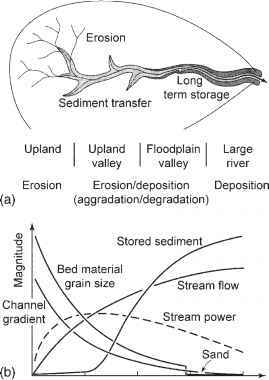 Although reconstructed as a single-thread, meandering channel based on estimated bankfull flood and the Rosgen classification system, a flood with a 6-year return interval occurring only months after project completion transformed the constructed channel into a wide, braided channel. Kondolf et al. argued that geomorphological analysis of the reach itself, of historical conditions, and taking into account a longer corridor would have supported a different expectation, more similar to the flood's outcome. Detailed field studies are expensive, of course, which led managers to adopt classification approaches in the first place. An ideal channel classification will both advance scientific understanding and be useful for management, and this requires that classes be process-based (as in Table 3.3). Whether classification of channel type will commonly be sufficient to set restoration guidelines, versus the need for more technical site-specific analysis by geomorphologists and engineers, continues to be argued. The "river styles'' approach illustrates a promising classification of relatively homogeneous reaches into a limited number of categories that can be combined with a prioritization for conservation and management. Employing a nested hierarchical framework of catchments, landscape units, river styles, and geomorphic units, Brierley and Fryirs (2000, 2005) identified nine styles of river character and behavior for the 1,040 km2 Bega Catchment of New South Wales, Australia. Much of our prior discussion of river types and geomorphic processes is relevant, although Brierley and Fryirs emphasize the distinctive aspects of Australian rivers that are the consequence of a very old, bedrock-dominated landscape with high hydro-logic variability. The authors also suggested how to prioritize reach-scale management strategies within an integrative catchment framework: first, conservation should precede restoration; second, we should work to improve sections where natural recovery potential is high; third, we should be thoughtful about investment of effort in reaches with low rehabilitation potential.